When you've chosen the perfect bathroom vanity for your space, you may think that your design project is through, but there are many ways to jazz it up even further. According to Better Homes and Gardens, using a combination of chic shelving and mosaic tile can create an idyllic spot to wake up to in the morning. For example, if you've invested in a vanity featuring copper faucets and dials with a dark wood medicine cabinet and counter top, you already have a fabulous neutral backdrop to work with. Consider using a selection of brown, tan and pale green mosaic tile behind this area to create a one-of-a-kind arrangement. Shelving is also a big consideration, so consider using a few small symmetrical shelves on either side of your mirror. This can hold everything from toiletries to small candles, and it will give you yet another place to incorporate a number of chic decorative accents. 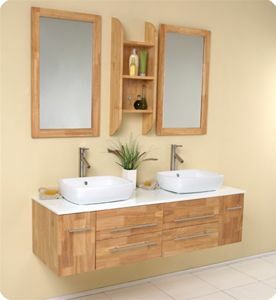 The possibilities are nearly endless in the world of bathroom design, but paying particular attention to your vanity can yield fantastic results. What small additions have you used to improve this area of your bathroom?